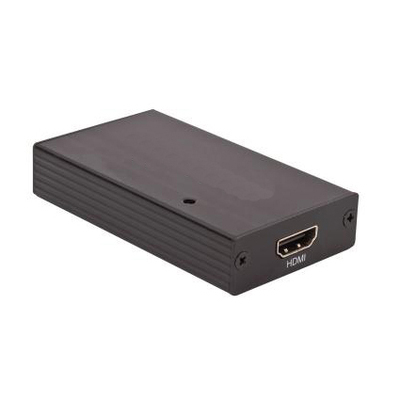 Featuring the latest and highest performance USB graphics technology inthe smallest package available, the USB 3.0 to HDMI graphics adapter lets youconnect additional HDMI displays to your Windows-based laptop or desktop viaSuper Speed USB 3.0 or USB 2.0. Add up to six additional displays with USB'splug-and-play ease. One adapter required per display. Multiple monitors enhanceproductivity by enabling the use of separate monitors for different documentsor applications, for more efficient multitasking and document editing. Highestavailable USB graphics performance on both USB 3.0 (5 Gbps) and USB 2.0 (480Mbps), using DisplayLink's new DL-3500 chipset. Supports HDMI or DVI displayswith resolutions up to 2048x1152 / 1920x1200. HD 1080p motion video via USB 3.0(limiting playback to a 480p or 720p window is recommended for USB 2.0). USBgraphics uses your system's main CPU and GPU for graphics rendering - werecommend playing 3D games on your main GPU attached display. Audio over HDMIwhen the adapter is the default audio device. Dual core or2Ghz (or better) CPU recommended. Windows 8 /Windows 7/Vista (32-bit or64-bit).XP SP2 or higher (32-bit only). Requires Intel / AMD / nVidia main GPUand driver with Windows Aero enabled. Drivers install automatically via WindowsUpdate when the adapter is attached (Internet connection required); driversalso are available on an included CD. Not compatible with ARM-based Windows (MSSurface). No Apple Macintosh or Linux support. Uninstall non-DisplayLinkdrivers for USB graphics adapters before installing drivers for this adapter.